This beautiful apartment is suitable for 4 people, and was refurbished in October 2014. Its decoration, distribution and equipment will ensure that you enjoy a pleasant stay in the capital. In addition to the two rooms, there is an open courtyard which will guarantee you some peace and relaxation after long days of sightseeing. The bedroom features a double bed 160x200 and there is a double sofa bed in the living-room. 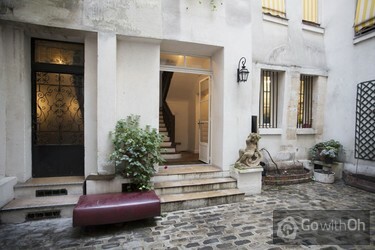 Located in Rue des Rosiers, you will be able to easily discover the charm of the Marais. 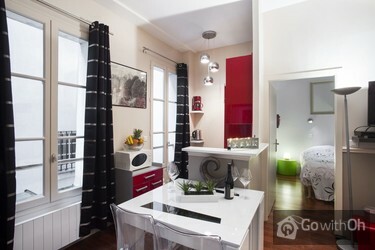 The apartment s just 10 minutes' walk from the River Seine and the Ile Saint-Louis. The St. Paul metro station (line 1) is only 350 meters away, and will take you directly to the Louvre Museum, the Place de la Concorde or the Champs Elysée. In addition, you will find many shops, cafes and restaurants nearby. The apartment is in perfect condition, even a bit 'new'! 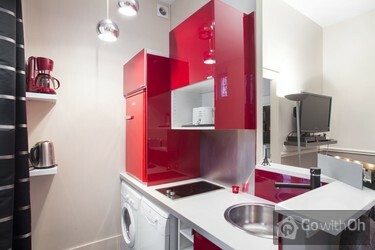 It is basically a fully-renovated and beautifully-designed apartment inside a 300 year building. My only complaint towards the housekeepers was the very weak Wifi connection - they promised it will be fixed soon though. All in all - a fantastic offer! Mikrowelle und eine Steckdose funktionierten nicht.Sonst war alles prima ! The perfect location for a few days in Paris. Accommodation almost perfect (except for the microwave and broken socket). Perfect for 2. Comfortable for 3. Perhaps a bit cosy for 4 since the bathroom is off the main bedroom. In the heart of one of the most exciting buzzing areas of Paris. I'm ...sure we'll be back again. Excellent and very prompt service from All-Paris. Very accommodating in every way. Thank you. This apartment is quiet and is in a very good location. English speaking contact person was very helpful and friendly. Very comfortable apartment. 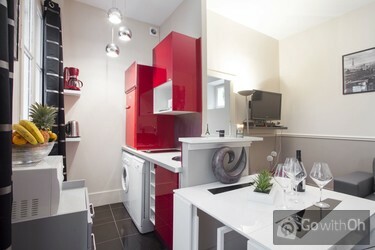 Communication with all paris apartmanets was great and they made the whole process very easy. Alles vorhanden was man für eine Kurzstädtereise so braucht, sogar Spülmaschine und Waschmaschine. The service with the contact person was o.k. as the owner used an immediary which was not told before. no comment, we had a great time, nice apartment. Muy céntrico, bien equipado......; le faltaba un poco de limpieza al llegar. Por lo demás todo muy bien. We loved our stay in Rue de Rosier. Was excellent location & the apartment catered for our needs. Thomas was excellent in regard to liaising with us. Met us at the apartment mid afternoon & was most helpful to we 'first timers' in Paris. Free phone & wifi were a pleasant & appreciated inclusion. 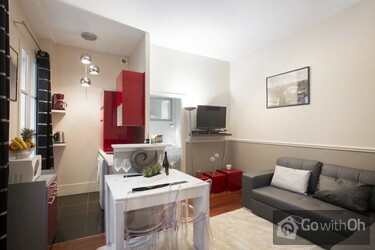 La ubicación del apartamento está genial, en una zona peatonal con mucho encanto y cerca de Notre Dame. El apartamento está estudiado hasta el último detalle, tiene de todo y muy nuevo. Decorado con mucho gusto. Nos hubiera gustado mayor limpieza debajo de la cama, pero de resto el ...apartamento estaba limpio. Jeremy es un encanto y nos ayudó en todo,muy amable ny servicial. Todo perfecto. Ningún problema. El contacto muy amable y atento. Fuimos con 2 niños y resultó fenomenal. Recomendable. La calle en la que está situado con encanto. Alles wie in der Beschreibung im Internet. Sehr gute Ausgangsposition, um Paris zu erkunden. Mitten im lebendigen Marais gelegen ist die Wohnung sehr ruhig. Wir kommen gern wieder! 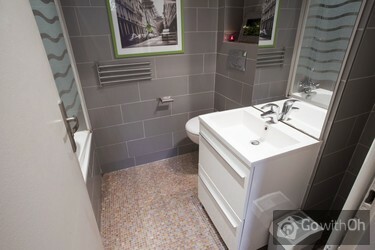 Excelente el trato,con comportamiento flexible por parte de los propietarios que hace que solo te tengas que preocupar de tu estancia en paris.Está muy bien comunicado con todo,al lado de monumentos como por ejemplo NOTRE DAME, ST-CHAPELLE....además de ser un barrio turistico.Recomendamos ...sinceramente este apartamento,sin duda cuando vuelva a paris volveré a cojer este apartamento. It ws a pity that despite us following the arrival instructions and Texting at least 45 minutes prior to arrival this was not acknowledged and we were kept waiting outside in the cold for more than 30 minutes after checkin time. The we had to wait while the helpful person went to fetch ...bedlinen.Theperson who turned up ( no name) was helpful and friendly but the nominated arrival contact was non responsive. It woudl be helpful to provide a kettle and some form of heating for the main room. It is a nice, clean, quite flat with a friendly neighbouhod. always again. appartement fonctionnel, bien situé. toutefois voisinage du dessus un peu sonore bonne prise en charge, correspond parfaitement aux photos et à la description du site web. wat een heerlijk apartement op een geweldige plek, compleet, fijn bed, lekkere douche. Ontzettend aardig en gastvrij ontvangen. Alles in de buurt..Ja echt een adres om terug te komen. 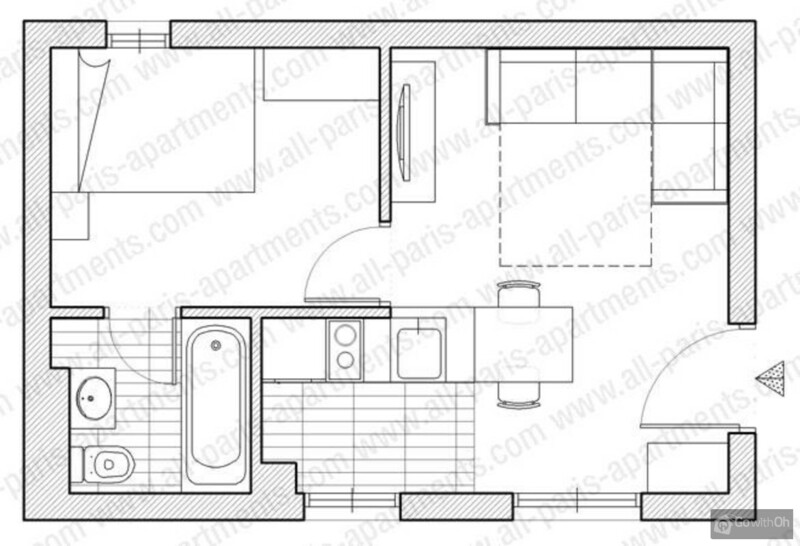 The apartment was very 'compact', but otherwise was hard to fault. Everything was clean and well maintained and the location was excellent. If we'd been staying longer we'd have wanted an oven, but as it was only for four nights we managed without. There are plenty of interesting eating places in ...the immediate vicinity (the apartment is in the Jewish quarter of the Marais) for anyone not wishing to cook. The contact people who met us at the flat were particularly friendly and helpful, especially following a Eurostar breakdown that meant we arrived in the middle of the night. I sent a text explaining the delay and they left a key for us to let ourselves in. As we left on an evening train, it was a big help that they also let us leave our luggage in the apartment during our last day, to be picked up before the next guests were due to arrive. Very nice neighbourhood with everything at hand: baker's, restaurants musea within walking distance, special shops etc. would definitely stay here again. Quiet as it is not facing the road. We also felt very safe. Although use of phone was mentioned in description it was a pleasant asset so was the wifi connection. siamo stati benissimo!ci siamo mossi spesso a piedi, vista la posizione centrale (il quartiere marais e' il migliore per noi!). i servizi corrispondono esattamente all'annuncio. unica cosa: un passeggino di qualsiasi dimensione non entra nell'ascensore, quindi bisogna fare le scale. Apartment was exactly as described, all very nice, warm, clean and tidy. An excellent base for our Paris Holiday! All aspects of the accommodation were very good, with one exception, one noisy neighbour. We signed an agreement to limit any noise after 10PM unfortunately this rule does not apply to permanent resident. Bellissimo e soprattutto pulitissimo appartamento, le foto sono molto fedeli alla realtà! Posizione perfetta! Le persone di contatto molto gentili e disponibili! tutto perfetto!! Très bien situé. Excellente situation, accueil très agréable. The apartment was great, but we had no bedroom light the whole time we were there, despite asking the representative to fix it. Our accommodation was very clean which is one of the most important things for us when travelling. Unfortunately it was very noisy with other people in the same complex yelling out at each other and loud music being played on occasions. Other than that the accommodation met our needs. Very small for 4 (and would be quite expensive for 2). Everything in the kitchen and bathroom placed very high, yet space poorly exploited - indoor architect consultancy would add great improvements. The contact people were very demanding (endless e-mails) for our prior information on time of ...arrival (four days in advance and again outside Paris). When I sent my 4-day advance info along with the booking number I was later carefully instructed to resend also with apartment ref. no and arrival/departure dates - sloppy in my opinion. In the end this was all worthless as we got stuck in a 90 minute traffic jam in Paris, and the contact person was very upset when we arrived although we had several times informed of the developing situation - arrogant in my opinion to expect non-locals to predict Paris traffic habits. When we sent our expected time of arrival 4 days earlier the contacts should then have indicated expected delays in the traffic hours. He did turn milder though thanks to my charming wife keep information simple and stringent - avoid excessive information and endless e-mails. Also I got information from two sources requesting the same down payments which was quite confusing. We advise clients that they must contact the contact person at least 4 days prior to arrival to arrange the check-in time. Just perfect in every way!.Amazing location. Apartment was well equipped , spotless & even included free international calls. T. came on a Sunday morning to drop off keys & allow us in early as the apartment had been vacated the evening prior to our arrival. Very much appreciated as we had just had a long-haul flight from Australia. The accommodation and facilities were excellent. If I were to give any suggestions I would recommend that you have in the apartment map/maps on Paris and subway, taxi rank location and tourist suggestions and recommended good eats in district. Doesn't need to be exhaustive. We arrived at the ...apartment at 7pm and forgot to grab a map and the next morning early we had to get ourselves over to Fat Bike Tours. Thanks again, brilliant! A spare set of keys would be helpful, when we go out & return separately. The washing machine did not wash & dry the clothes well. A lot of lint, so we used the laundromat next door. 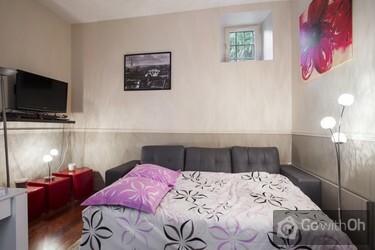 Great apartment, great location, contact person really helpful. We had a great time, everything was tip top. Great Room...could have used a fresh coat of paint. Walls were a bit dirty for my taste. Also could have used extra pillows with pillow cases and blankets. TV did not work properly, but we didnt worry about it. Our flats location was better than excellent, easy to access by cab, metro, and bus. Very fun neighborhood, lots of good eating & snacking/coffee options. The flat itself was small but they made good use of space. Only downside was the flat could have been cleaner. They would benefit from a good ...deep cleaning & more fresh towels. Aside from that, the bedding was good, and for the location this is a good option. Apartment would benefit from thorough clean (including carpet) and improved shower facility. Also, on at least two occasions an unknown person had entered the apartment when we were out (NB window opened, door lock altered, bin position changed). Great appartment in a fantastic location. Had a few issues with using the dryer. Soggiorno davvero indimenticabile. Tutto è andato liscio, nonostante il nostro pessimo francese. L'appuntamento davanti all'appartamento da parte della persona di contatto è stato rispettato. 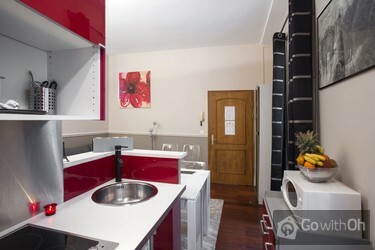 Le condizioni di pulizia dell'appartamento erano discrete, considerando gli standard francesi. Tutto ciò ...che era segnato come attrezzature era effettivamente presente. Che dire poi della posizione? Non esiste una posizione migliore per visitare la città a piedi!!! Ottime boulangerie nei dintorni e squisitezze a ogni angolo! Consigliamo l'appartamento senza dubbio e credo ci torneremo presto! Die Unterkunft ist einfach und zweckmässig eingerichtet. Der Unterhalt ist eher dürftig: zerbrochener Spiegel, fehlende Aufhängknöpfe oder beschmutzte Wandstellen hinterlassen einen etwas ungepflegten Eindruck. Die Betten im Schlafzimmer sind etwas weich. Der eher laute Ventilator in ...Küche/Wohnzimmer springt zu verschiedebeb Tages- und Nachtzeiten automatisch an. Insgesamt ist die Unterkunft mit recht neuer Einrichtung aber OK und bietet 4 Personen auf wenig Raum viel Platz. Das Preis/Leistungsverhältnis ist OK bis gut. Die unmittelbare Umgebung ist recht laut und der Hinterhof eher etwas düster. Laute Musik und Geschrei haben diejenigen mit einem leichten Schlaf während zwei von vier Nächten wach gehalten. Die Nähe zu Sehenswürdigkeiten, gemütlichen Bistrots und Einkaufsmöglichkeiten ist wirklich toll!! Der Empfang war super freundlich, unkompliziert, flexibel und kompetent, Kompliment! Tutto come descritto e come rappresentato nelle foto. Posizione eccellente, vicinissima alla metro, in quartiere residenziale. Rapporto qualità prezzo ottimo. Consiglio a tutti...ma forse meglio essere in due, sconsigliato per 4, soprattutto se volete pranzare/cenare in casa....ma, ripeto, OTTIMO per 2. Posizione imbattibile in una zona centralissima e sempre vitale a tutte le ore. Peccato per la puzza insopportabile di vernice all'interno dell'appartamento che abbiamo trovato al nostro arrivo e non siamo riusciti ad eliminare neanche aprendo tutte le finestre. Un incubo che ci ha accompagnato ...fino al nostro rientro a casa avendo riscontrato che tutto il nostro bagaglio era intriso di quel tanfo malsano. Gentile Cliente, La ringraziamo per la sua recensione, importantissima per darci la possibilità di migliorare il servizio che offriamo ai nostri clienti. Siamo profondamente spiacenti per il disagio causato dal cattivo odore di vernice, e le confermiamo che si è trattato di un caso eccezionale dovuto a lavori di ristrutturazione effettuati di recente, e che hanno previsto anche la biancheggiatura delle pareti. Lo mejor la ubicaciion y el contacto que estuvo atento a nuestros llamados. Excelente debut en París ... Sin dudas regresariia! per la qualità dell'appartamento e per non aver avuto problemi sia nella prenotazione che nel servizio. Manca solo un pizzico di attenzione alla cura degli oggetti presenti nell'appartamento (doccia, materiale per la cucina); Ma nel complesso l'appartamento era buono, le persone di contatto sono state precise e disponibili la posizione in Parigi veramente ottima. Todo perfecto, lo único malo es que el propietario me hizo esperar una hora en la puerta del apartamento para entregarme las llaves. Sehr gute Lage, ruhig. Eher klein und dunkel. Für einen Kurzaufenthalt ganz okay! L'appartamento non era grande come sembrava nelle fotografie. Abbiamo dovuto attendere più di un'ora rispetto all'orario concordato con il proprietario. Bella la zona in cui è ubicato, comoda al metrò. Un aspetto positivo è di poter effettuare dal telefono dell'appartamento le telefonate ai numeri fissi sia francesi che italiani senza pagare. 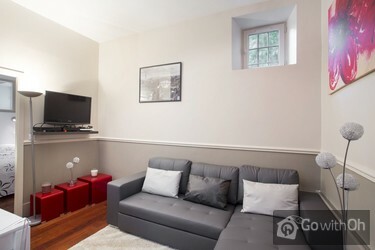 apartment is in a perfect location, walking distance to paris major places to visit; perfect for two, forget to live there in four (one ensuite bathroom and a very small living area). apartment seems recently refurbished and with new furnitures, but same details should be improved (a big stain on ...the wall behind the sofa, some lights not working, living room with no heating could be quite cold in winter). 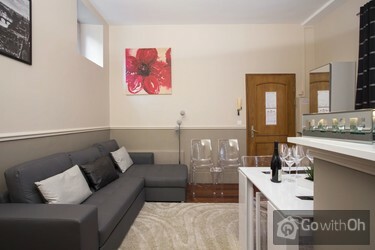 Nice apartment in a great area, very convenient to all the sites and local restaurants/shops. Everything was in good condition and worked well - we were especially happy to have a coffee maker in the mornings. Overall very good value for money and we would stay there again. L'appartamento che ho scelto è in una posizione eccezionale: nel cuore del delizioso e vivace quartiere del Marais. Perfetto per visitare Parigi. Vicinissimo alla fermata Metro S. Paul. ma anche punto di partenza per scoprire la città a piedi. L'appartamento è curato, pulito ed attrezzatissimo. ...Tanti i locali e i negozi in prossimità, anche per fare la spesa. Puntuale e disponibile T per dare le chiavi dell'appartamento e nel dare informazioni utili per organizzare al meglio il soggiorno. Assolutamente un'esperienza da ripetere. Tornerò sicuramente! Escelente estancia, muy buena ubicaión, el departamento es tal cual lo detallan las fotos. It was great, if we go to Paris again we will definitely stay here again. Everything was perfect, we really enjoyed it. El apartamento es ideal por su situación y por el barrio en el que se encuentra. Muy cerca de la catedral de Notre-Dame, del barrio latino, del museo del Louvre y del río Sena. Nosotros hemos regresados encantados y echamos de menos este pequeño apartamento tan acogedor. El dueño T. es muy agradable y su trato fue excelente. L'appartamento è molto carino con tutte le comodità. La posizione centrale è ottima. Ci ritornerrò sicuramente per un'altra vacanza. Solo estuvo en contacto un representante de la dueña en la entrega del apartamento. Telefónicamente nos permitió hacer el check out a la tarde.El apartamento estaba muy bien equipado y excelentemente ubicado en plena Marais. Ubicazione dell'appartamento centralissima e a due passi dalla fermata della metro. The appartment is quite dark, all the windows face dark yard. Not as clean as we expected, the bed was very uncomfortable, probably too old, however it was clean. The last point about location, it is very central but very specific, as it is the very center of the Jewish quarter. El apartamento era pequeño y las vista aun patio de luces.Pero estaba limpio y la cama es muy comoda.La ubicacion muy buena a unos 8 minutos andando a Notre-Dame. L'appartamento è assolutamente troppo piccolo per 4 persone, il divano letto è usurato, la seduta che funge anche da materasso è ormai concava ed è impossibile dormirci e la tappezzeria è sudicia, il bagno non ha la finestra ma un aeratore sempre acceso dal quale esce "odore" di fumo di ...sigarette. Tutte le finestre affacciano su un cortile interno piuttosto sporco e neanche troppo spazioso. Non ci torneremo. Gentile Cliente, Da Oh la ringraziamo per la sua recensione. Il proprietario conferma che il divano letto è stato sostituito e la decorazione è stata rinnovata. Conferma inoltre che laeratore del bagno è stato impostato per funzionare solo quando viene attivato Prossimanamente pubblicheremo nuove foto dellappartamento. The apartment was exactly like it was in the pictures and was very clean and provided all the necessities. This apartment was perfect for 3 people - plenty of room (by Paris standards), and we had room to store our clothes and suitcases to boot. The bed was soft and comfortable, and the sofa has a trundle that pulled out, making it into a full size bed. With the memory foam pad, this was also very ...comfortable. The apartment had plenty of equipment, and the entire apartment is beautifully furnished. The apartment is off a quiet section within the Marais district, and was the perfect location for keeping us centrally located.The key exchange was easy, with M meeting us at the door when we arrived. She was very helpful, and I highly commend her for the wonderful apartment and the communication prior and during our stay.I will definitely use this apartment again in the future! M's customer service and the loveliness of the apartrment are the top reasons for why I will use this service again! Everything was perfect, the check-in person was punctual and informative, the location fantastic and the apartment itself was just lovely, highly recommendable. The apartment was comfortable and quiet. It was fabulous being able to walk out the door and be in the centre of the Marais district. The person who greeted us was friendly and very helpful. I highly recommend this apartment. 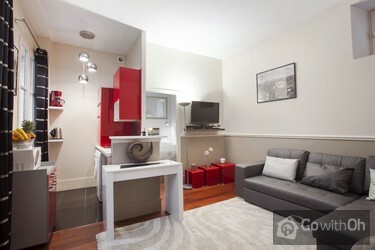 Lovely apartment, very helpful contact person and fantastic location. Would definitely recommend to others. L'appartamento e' veramente carino, ben arredato e rispondente alle caratteristiche citate sul sito; ubicazione fantastica in pieno centro marais! Note negative: la corte dove e' situato e' rumorosa di notte, quindi non penso sia alloggio adatto per famiglie, ma puo' andare per giovani "nottambuli"! Gentile Cliente, La ringraziamo per la sua recensione. 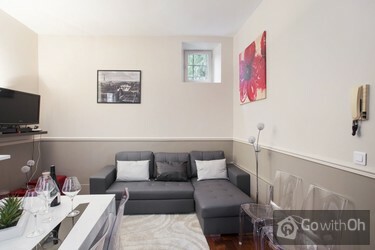 Le confermiamo che lappartamento si trova in una posizione centrale eccellente, nel quartiere del Marais. Nella sezione Posizione della descrizione dellappartamento, potrà vederne lubicazione esatta nella piantina della città. Siamo spiacenti per il disagio subito durante il soggiorno, e le confermiamo che si è trattato di un caso eccezionale, causato da un vicino particolarmente rumoroso: le ricordiamo che nel caso in cui ci fosse qualsiasi inconveniente durante il soggiorno, è possibile chiamare la persona di contatto, che è a completa disposizione degli ospiti e garantisce assistenza immediata. Le confermiamo inoltre che questo appartamento è adeguato sia per il soggiorno di una famiglia che di un gruppo di amici. Il mio soggiorno a Parigi è stato di mio gradimento. Queremos manifestar que faltaban toallas de cara y mano. Para la época de verano por lo menos dos ventiladores. Estimado cliente, agradecemos y valoramos sus comentarios. El propietario confirma que siempre proporciona una toalla de lavabo y una de ducha por persona para toda la estancia. Excellent location; well-appointed; friendly host; hope to stay here again. Ich war mit der Ferienwohnung sehr zufrieden. Die Wohnung ist sehr zentral und sauber. Das einzig merkwürdige war die Lüftung in der Küche, die nachts um zwei anfing zu laufen, dies hat unseren Urlaub jedoch nicht weiter beeinträchtigt und wir würden jederzeit wieder diese Wohnung buchen. Mit der Kontaktperson hat auch alles prima geklappt. Alles einwandfrei, die Lage war fantastisch. Bitte das Besteck auf Vollständigkeit prüfen, bei uns hat ein Messer gefehlt. Die Lage ist perfekt. Schlüsselübergabe problemlos. Mit vier Personen wäre es schon eng. Wir haben die Wohnung zu zweit genutzt. Das war sehr gut. Die Lage der Wohnung ist ideal, mitten im Marais! Leider lässt die Instandhaltung der Wohnung zu wünschen übrig. Nur 1/3 der Lampen funktioniert - z.B. funktionieren weder Licht noch Steckdose im Bad. Dort gibt es auch keinen Halter mehr für Toilettenpapier und der Toilettensitz ist lose. In ...der Küche fallen die Regalbretter aus der Wand und ein Topf angebrannt (mit Zettel "please do not use"! Ich habe ihn dann gereinigt).Überhaupt ist die Ausstattung der Küche minimalistisch. Die im Foto abgebildeten Weingläser gibt es nicht (Wein aus dem Wasserglas in Paris!) und es gab nur 3 Frühstücksteller.Am zweiten Tag funktionierte der elektronische Türöffner der Haustür nicht - zum Glück war einer von uns im Appartement, denn die Kontaktperson des Vermieters reagierte erst nach 2 Stunden. Lieber Gast, vielen Dank für Ihr Feedback. Eine der Glühbirnen im Bad funktioniert leider zurzeit nicht, da hier noch eine elektrische Reparatur aussteht, diese wird jedoch in Kürze vorgenommen. Es gibt jedoch weitere Glühbirnen im Bad, welche problemlos funktionieren. Zudem bestätigt der Besitzer, die Kücheneinrichtung überprüft, den Topf ausgetauscht und Weingläser hinzugefügt zu haben. Zentral gelegen, sehr sauber und alles nötige vorhanden.